Monday, Aug. 1, 2011 11:36 a.m. MDT. By Peter Orsi, Associated Press. 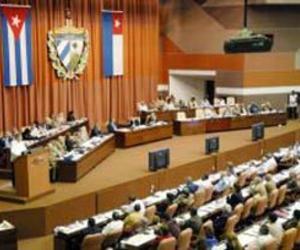 HAVANA, Cuba — Cuba's parliament began one of its business-packed twice-yearly sessions on Monday, a gathering that might enact some of the reforms that the government has promised in efforts to revive the stalled economy with a dose of private enterprise. General guidelines for the reforms were approved by the Communist Party at a summit in April, but there has been relatively little action since. The party is not a lawmaking body, so it is up to parliament to turn the recommendations into reality. President Raul Castro, who took over definitively from his older brother in 2008, has said officials are going at their own pace on the reforms and will be neither hurried nor delayed. Foreign journalists were not invited to attend the session of the National Assembly, which Party newspaper Granma said would "analyze the progress of the economy in the first semester of 2011 and the development of the plan to update the country's economic model." Already the government has licensed nearly 200 types of private-sector activity in which Cubans can go into business for themselves and hire employees, though Castro emphasizes that the country is not abandoning socialism and there is no sign that any large industry will be privatized anytime soon. "The state of Cuba is in a genuine transition toward a new political economy and society, and it's a transition in which the people of Cuba are beginning to find their voices through independent employment," said Robert Pastor, a Cuba expert and professor of international relations at American University. Also pending are potentially blockbuster changes such as allowing Cubans to freely buy and sell homes and cars by year's end, for the first time since the 1960s. Meanwhile, plans to lay off hundreds of thousands of government workers, as well as talk of phasing out the monthly ration card of basic goods, have some Cubans anxious despite assurances that the neediest will not be forgotten. Until now, the state has employed the vast majority of workers. "The government is trying to bolster the economy without losing control, so this will be a period of some uncertainty and tension that will extend for a period of time," Pastor said. "I think the question is whether Raul will be able to reassure people that they will not be abandoned just because the state is shrinking in size, and to find a way to communicate that so that they can continue moving forward on the reforms." The plenary session got under way Monday morning with Castro presiding. Lawmakers approved a resolution demanding the release of five Cuban agents sentenced to lengthy prison terms in the United States, but there was no immediate word on debate of the economic changes. Nor was it clear whether Castro addressed the body. He did not speak last week as Cuba celebrated its Revolution Day holiday. Lawmakers have been meeting in committees in recent days, but few specifics have been released in Cuba's official news media. Castro has also pledged to groom a new generation of political figures who will ultimately take up the baton of leadership. Raul turned 80 last month, while older brother Fidel Castro, who has looked frail in his limited appearances, is about to hit 85. At the Party Congress in April, Raul Castro tapped a ruling party council mostly made up of the older, revolutionary generation, but hinted that fresh faces could be named ahead of another gathering in January 2012.